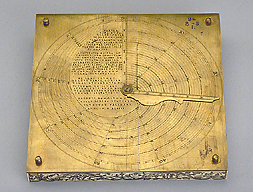 The compass is made of wood covered with ivory. The borders of the instrument are engraved with a shadow square 60 to 0 to 60 on each side, divided by ten and by two, numbered from ten to 60 by ten. Some parts have divisions to one degree. Further towards the centre is a brass square plate with a shadow square, similar to the one on the ivory sheet. Inside the square plate is a round compass, made of a ring of ivory and with a brass compass plate. The glass is a later replacement. The ivory ring is carved with a zodiac scale on the rim, divided to ten, subdivided to one by alternate red colouring, numbered from 10 to 30 by 10, with the symbols of the zodiacal signs. Further towards the centre is a calendar scale, divided to ten and to five days, subdivided to one by alternate shading, numbered by ten from ten to 30 or 31 or 28 as appropriate. On an inner circle are inscribed the names of the months in Latin, and some holy days and saints' names are inscribed radially. In January: 'CIRCVM', 'EPIPH', 'OSEB', 'VINC', 'CONVP. ', in February 'PVR M', 'CAT ? P ? ', 'MATH', in March 'GREG', 'AN<N>V M', in April 'GEORGI', in May 'PH INC', 'VRBANI', in June 'MED', 'VLTI', 'IOH B', in July 'VIS ? M ? ', 'VLRICI', 'MARG', 'IACOBI', in August 'PET ? CA', 'LAVR', 'BARTOL', in September 'EGIDI', 'NAT ? M', 'EXAL [cross]', 'MATEI', in October 'GALLI', 'LVCAS', 'SIM IVD', in November 'OMN ? S', 'MART', 'CLEM', 'CATHAR', 'ANDR', in December 'LVCIE', 'THOMA', 'NAT ? CHR'. A brass concentric ring with diametral indexes is fixed to the ivory ring. On the brass ring are engraved hours, divided to the half-hour and to the quarter hour, numbered 1 to 12 twice. Engraved on the brass compass plate are engraved the initials of 32 compass points, the four cardinal points named in German in a lighter, different script. The needle is missing and the glass is detached. The back of the block is covered with a brass plate with four bun feet. The plate has a table for finding the ratio between the lengths between the same two meridian lines at a certain latitude and at the equator. The outer circle is engraved with a circular scale of latitudes, divided to five and to one, numbered from ten to 90 by ten. A radius of the circle is engraved with a linear scale of latitudes from ten to 60, divided to ten and to five, subdivided to one, numbered from ten to 60 by ten. From the linear scale start spiral lines for each two degrees of latitude, numbered from ten to 60 by ten, with a dotted line within ten degrees. An inscription in the space inside the circle reads 'TABVLA NOVA ET FACILIS CONVERSIONIS GRADVV PARALELORVM EXTRA AEQVATOREM IN IPSIVS VEL CVIVSVIS ALTERIVS MAIORIS CIRCVLI GRADVS. AD MOVEATVR REGVLA AD LATITVDINEM QVAESITAM IN EXTERIORI LIMBO ET QVOT PVNCTA IN REGVLA CORRESPONDENT LINEIS SPIRALIBVS SIMVL IVNCTIS IN CONTACTV REGVLAE: TOTI DE MINVTA AEQVATORIS FACIV<N>T GRADVM INTEGRVM IN ILLA LATITVDINE. SI VERO PLVRES GRADVS SIMVL CONVERTENDI: NVMERENTVR TO TOTIDEM IN LINEIS SPIRALIBVS ET IN REGVLA CORRESPONDEBVNT GRADVS AEQVATORIS. IACOBVS RAMMINGER ALIAS SCRIBA STVTGARD: INVENTOR FACIEBAT ANNO . M D C XCIIII'. A ruler fixed to the centre is engraved with a scale of latitudes from zero to 60, divided to ten and to five, subdivided to one, numbered by ten from 10 to 60. The ivory which covers all sides of the wooden block is engraved with foliage in-filled with black ink. The instrument was purchased in 1896 and is described in F. A. B. Ward, A Catalogue of European Scientific Instruments in the Department of Medieval and Later Antiquities of the British Museum (London, 1981), p.102, no. 301.